Getting the right medicines to the right people at the right time is what any pharmaceutical company needs to do to be successful. By viewing pharmaceutical needs by territory, age and risk factors, a company can better plan for inventory levels to meet the needs of their customers. These insights help to avoid unnecessary carrying charges due to excess inventory. 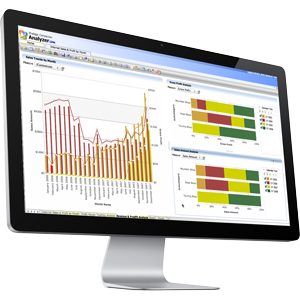 Analyzer’s Recombinant BI functionality and heat map visualizations are an easy way to see these needs by region, giving your company the best chance to be there when your customers need you the most. A strong research and development division helps to keep your company competitive in an ever-changing market. To ensure rapid development, accelerate clinical trials and ensure regulatory compliance, your company needs reliable, real-time analytics. The pharmaceutical industry is dependent on aggressive sales and marketing strategies to safeguard their competitive position in the market. Understanding sales and marketing performance and geographic demands, helps your company out perform your competitors.